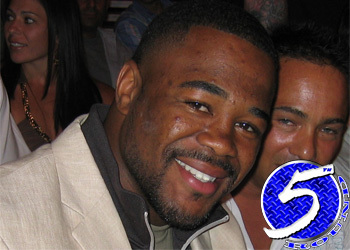 For the second time in as many fights, former UFC light heavyweight champion Rashad Evans (pictured) will face a fellow Fox Sports broadcast partner. During Friday’s UFC Fight Night 33 pre-fight show on Fox Sports 2, Evans announced he’ll welcome Daniel Cormier to the 205-pound division at UFC 170. The February 22 event takes place inside Mandalay Bay Events Center in Las Vegas, Nevada. Evans and Cormier will headline the pay-per-view broadcast. “I don’t want to fight DC. We go way back to college. I’ve been sick about it over the past few days,” Evans admitted before taking a it’s-just-business approach. Evans posted a vicious TKO victory over Chael Sonnen last month at UFC 167 to collect his second straight W. “Suga” has won six of his last eight scraps. Cormier, meanwhile, takes his unblemished 13-0 record to a brand new division. The 34-year-old previously admitted the clock is ticking on his brief MMA career and he wants to compete for the title before it’s too late. Since Cormier expects AKA teammate Cain Velasquez to dominate the UFC heavyweight throne for an extended period of time, he felt his best crack at capturing a belt would be to shed some weight. In addition, he’d love to crack reigning champ and bitter rival Jon Jones across the head. No word on where the winner will land on the UFC light heavyweight totem pole.